The Katana is the soul of the samurai. It’s distinct appearance with a single, curved blade and long grip for two hands is recognized worldwide. 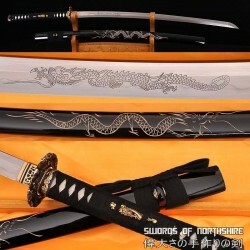 Our katanas are handcrafted in the historical Shinto style of samurai swords and made with intricate detail. We use top quality materials, including 1060 and 1095 high carbon steel to craft authentic, hand forged samurai katana swords. All of our katana are fully functional and can be hand sharpened to a razor edge, if desired. 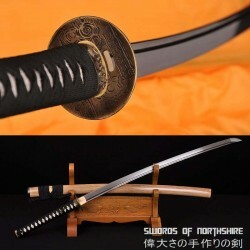 Whether you are looking to add to your samurai sword collection or rush into battle, our katana will serve your purpose. 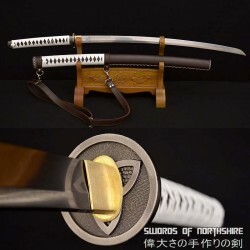 Are you interested in other samurai swords? 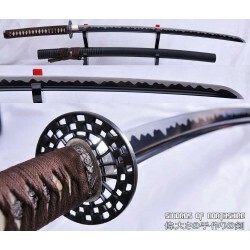 Check out our odachi, wakizashi, or tachi swords. The cutting edge of the sword is on the reverse side. 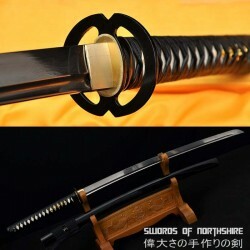 This type of sword is called Sakabato, made fa.. 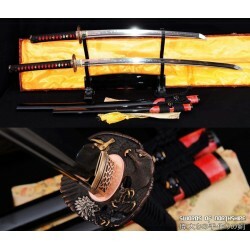 This Katana offers great quality at a reasonable price. Featuring our hand forged and polished 1060 .. 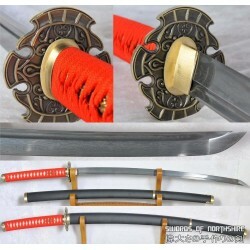 This sword is made of 1095 high carbon steel with a polished mirror-like surface. The blade is repea..